Celebrated winemaker Jesús Guillén died Nov. 5, 2018, following a brief battle with an aggressive cancer. He was 38. His final illness struck as he was cleaning barrels in preparation for the 2018 harvest, one which he would not complete. Hospitalized in Portland in early October, he never returned home. After earning a degree in computer systems engineering at Universidad Autónoma de Chihuahua, Mexico, Guillén came to Oregon in 2002 to learn English, joining his father, Jesús Guillén Sr., who was working in the vineyard at White Rose Estate. He had no knowledge of or even much interest in wine. When he began tasting, he was struck by the memories the aromas evoked, a walk in the forest or the floral scents of his grandparents’ garden. He named two 1999 vintage Pinot Noirs his epiphany wines: Archery Summit Arcus Estate and Elizabeth’s Reserve from Adelsheim. Guillén started working with his father in the vineyards and eventually moved to the cellar. Not formally trained, he read every book he could about winemaking, talked to winemakers and was mentored by Mark Vlossak of St. Innocent, who was consulting at White Rose. Six years later, he became the head winemaker for White Rose Estate and was building his own brand, Guillén Family Wines. During an interview on June 25, 2018, for the Oregon Wine History Archive at Linfield College, Guillén explained the stylistic differences between the two labels. For White Rose, “the goal is to portray the classic attributes for Pinot Noir so being as pure as we can…the goal is to have elegant classic wines.” For his own label, he said, “I use techniques to add complexity to the wine, but they have to be in harmony…to evoke memories.” While becoming proficient in a second language, he was mastering two approaches to winemaking. Regarding the impact Guillén had on his winemaking, Greg Sanders, White Rose Estate owner and founding winemaker, recalls, “He always had a more practical orientation … I would want to do something sort of severe and he would suggest something slightly less severe and we would … move a little bit more sensibly as a result of it. Sanders contrasted their approaches: “Jesús liked to address people’s attention to more of the density of the body, he [preferred] a full [wine] and I was more about detail.” Sanders acknowledged the support of Guillén and general manager Gavin Joll for adopting whole cluster fermentation as a significant element of the White Rose style during early trials. Joll reflected on the 12 years he worked with Guillén: “I will always appreciate his talent, intellect and ability as a winemaker, but above all, I will admire how caring, kind and thoughtful he was as a person. He was a truly special person who had a profound and positive impact on those he met.” Owing to his familiarity with the procedures and winemaking style, he has taken the lead role in creating the 2018 vintage of White Rose wines. Anthony King, owner of King Wine Consulting, has been providing significant technical support to complete the 2018 vintage of Guillén Family Wines. Guillén’s brother, Dagoberto, and father have also been engaged in creating the wines. In addition, King has been consulting with Joll on the White Rose wines. 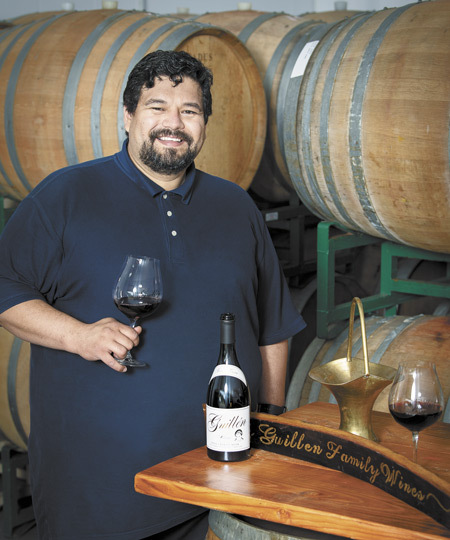 Over the past decade, Guillén gained recognition as the first Hispanic head winemaker in the state as well as the producer of consistently high-scoring Pinot Noir. Earlier this year, he was named one of “Top 40 under 40 Tastemakers of 2018” by Wine Enthusiast. He is also a subject of the recently released documentary “Red, White and Black: The Oregon Wine Story,” an independent film about the state’s minority winemakers. As his skills and fame grew, so did his confidence. When asked in the Linfield Archive interview if he believed he makes wines of the same quality as the two that changed his career path, Guillén responded, “I think I am performing at that level now.” Despite the recognition and his sense of accomplishment, he remained down-to-earth and well loved. To many, even those who knew him briefly, he was a dear friend. To those in the Hispanic wine community, he became a role model and generous mentor. Along with Sofía Torres McKay, owner and winegrower of Cramoisi Vineyard, and Miguel Lopez, the brand ambassador at Domaine Roy et Fils, Guillén began forming an organization to recognize and assist Hispanic vineyard workers in achieving their goals in the wine industry. The cover story in the August 2018 issue of OWP featured this project. Guillén’s passing has dealt an anguished blow to the project as Torres McKay poignantly explains, “There are no words to describe the pain [I feel from] losing our dear friend, Jesús, mi hermano, so humble, sweet and the kindest person I ever met, a big fighter with a huge heart, working toward the recognition of our Hispanic workers in the wine industry, working toward a way to make them feel part of our community, [so] that they are not isolated and [know] that we care about them and that we value and appreciate the work they do for us in the wine industry.” Evidencing the resolve to continue, she says the name of our group will be Asociacion Hispana en la Industria Vinicola de Oregon, AHIVOY, as Guillén wanted. “[W]e will continue to evolve and develop the things that Jesús, Sofia and I wanted to see for the future of our Hispanic workforce,” Lopez adds. “We shared the same vision of bridging the worlds that, at times, seemed isolated from one another (vineyard, winery, tasting rooms) and show that we, too, are as passionate about the work we did, even though we weren’t owners, managers, winemakers for the most part. The thought of him not being here to see this to fruition breaks my heart for us and the people we wish to see grow…we are part of the tapestry of the Oregon wine industry and Jesús was thread and needle….The best way that I can honor him is to keep running forward, don’t stop, keep moving.” Torres McKay reports that new members are joining AHIVOY to define and continue the work. Jesús Guillén is survived by his wife, Yuliana; son, Adrian; mother, Rosario; father, Jesús Sr.; brother, Dagoberto; and sister, Dalia Duran-Guillén. On Nov. 8, members of the Hispanic community, wine industry and friends of the winery joined the family to bid farewell to Guillén at the viewing, Mass and interment in Dayton and McMinnville. A GoFundMe account has been established for Guillén’s wife and son. Visit gofundme.com/jesus-guillen for more information. Industry response has been reminiscent of the outpouring in 2004 after the sudden death of Jimi Brooks of Brooks Wines, who was also 38 and left a young son. On Nov. 13, Ian Burrows, owner of Consulon, and Andrew Turner of Valley Wine Merchants in Newberg convened a meeting of some 20 restaurateurs, winemakers, retailers and media representatives to begin planning a series of fundraising events featuring Guillén Family Wines. Winter’s Hill Estate hosted a wine tasting and sale of Guillén Family Wines on Nov. 24 for the benefit of the family. On Dec. 6 at 7 p.m., a benefit dinner will be held at Ruddick/Wood in Newberg. For information and reservations, call 503-487-6133, or e-mail Meghan Peringer at meghan@ruddickwood.com. Information about future events will be posted on the Facebook pages of Consulon, Valley Wine Merchants and Guillén Family Wines. During his brief but significant career, Guillén created about a dozen vintages of Guillén Family Wines and 10 of White Rose Estate Pinot Noirs, whose aromas will not only conjure personal memories but, especially for those who knew him, evoke memories of this extraordinary gentleman and winemaker for years to come. Please visit guillenfamily.com if you would like to acquire some beautifully crafted Guillén Family Wines.